I downloaded The Vespertine from Netgalley, and it actually has the honor of being the very first book I’ve ever read on my Nook. And I’m very glad I did. I really enjoyed The Vespertine. Amelia was an interesting character. In the first few pages of the books, judging by her behavior and how her brother was treating her, I thought she was some little ho-ho who had compromised her virtue and then went insane. Needless to say, the very beginning of the book was engrossing, and instantly caught me in. I needed to know what would happen. I think the biggest thing about this book, is it leads you to believe that it’s more than it is, and after you read it, you’re left thinking “That wasn’t what I expected at all, but I loved it anyway.” That’s exactly what happened to me. From the cover, I went in with the notion of some epic fantastical romance with a magical, mysterious twist. What I got was a fantastical romance with a magical mysterious twist. (Without the epic.) It was a wonderful book, with a plot that moved and just the perfect pace, entrancing yet deliciously shady characters, and lots of Victorian-esque romantic drama. Sprinkle on a few pinches of magic, and you have The Vespertine. The romance between Amelia and Nathaniel was…. Thrilling. As a Victorian Era enthusiast, I already knew the decorum and rules set for this sort of society. So reading about Amelia and Nathaniel breaking those rules gave me butterflies, and I was practically swooning along with Amelia. They lived in a time when people did not go on dates to fall in love; they simply married for status, wealth, and beauty. Amelia is forced to disregard the aforementioned traits if she truly wants to be with Nathaniel… and she sure as hell does. I am a major fan of historical fiction, but I find that I don’t read it enough as I would like. 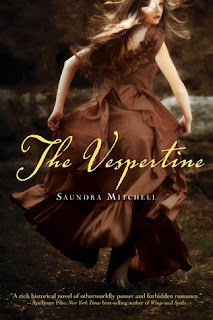 This novel is both historical, but with paranormal elements, so I think that any fans of paranormal should LOVE The Vespertine. That cover is BEYOND gorgeous. I got this from NetGalley too but haven't read it yet. I can't wait to get to it! Thanks for the review. I'm glad you loved it. Thanks for the detailed review! This book sounds really interesting. I've been debating on and off on whether to read it or not.